Brown patch is caused by a species of fungus called Rhizoctonia. In cooler climates It can be particularly harmful to tall fescue and ryegrass. The damage isn’t as extensive in Kentucky Bluegrass or fine fescues. 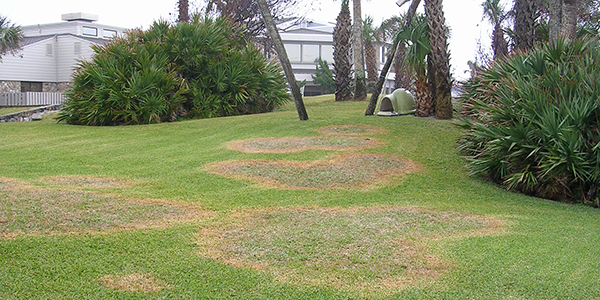 When it comes to climates similar Tampa it can affect St. Augustine grass and Zoysia grass. It is a foliar disease, meaning it harms the blades of grass but not the crown of the plant or the root system. What are the symptoms of Brown Patch? Brown patch presents as brownish yellow circular patches that can range from 6 inches to larger patches several feet in diameter. The affected leaves usually remain upright, and lesions can be seen on the leaves that are tan in color and irregular in shape with a dark brown border. How Does Brown Patch Happen? Brown patch is most likely to occur during extended periods of heat and humidity when night-time temperatures remain above 68° F. In addition to heat and humidity, the main factors inviting brown patch are excessive nitrogen and irrigation, lack of air movement, poor soil drainage, excessive thatch, and compacted soils. In other words, stressed and poorly maintained lawns. How is Brown Patch Controlled? The best way to deal with the brown patch is to avoid it by being on a sound lawn care regimen. Do not over-fertilize, use proper watering practices, aerate and dethatch once in a while and try to provide adequate air movement throughout the lawn area. Control of brown patch can be achieved through a number of chemical fungicides. 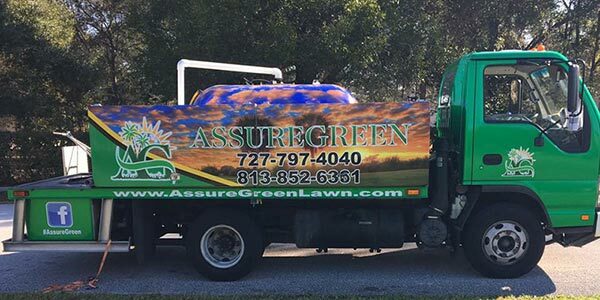 When considering fungicides, it’s best to deal with a lawn care company with licensed pesticide applicators on staff who are professionally trained to diagnose and treat lawn diseases. There’s not much one can do about the weather but be extra careful not to over-water or over-fertilize during periods of high heat and humidity, and increased night-time temperatures. Not an easy task I know, but that’s why lawn care is not as simple as a four step program. It involves timing, patience, trust, luck, and hard work.